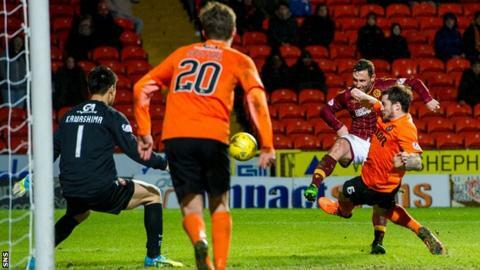 The aftermath of Dundee United's defeat by Motherwell has been a period of recriminations. Mixu Paatelianen said his team's performance was "flat" and "unacceptable". That turned out to be merely the prelude to stronger criticism from Tannadice chairman Stephen Thompson. In a statement that addressed the team having "failed miserably on the pitch", Thompson admitted to mistakes made in the boardroom. He finished with a withering remark: "The current playing squad now have 13 matches to preserve the club's Premiership status and redeem their own professional reputations." The 3-0 home loss was chastening, not least because United seemed to have embarked upon a revival, with two wins and a draw in their three games prior to Motherwell's visit. It was the moment in the season when Paatelainen's side had to show that they could recover, that resilience and purpose would underpin a revival. It fell short - jarringly so for supporters as much as the manager and the chairman - and has left United now feeling as though they are in the last throes of this campaign. It might already feel lost, although Thompson's strong, blunt words can be read as an attempt to provoke a sudden burst of defiance. Even so, desperation has invaded every aspect of the club. The boardroom mistakes Thompson admitted to might include not engaging in a more critical overview of the recruitment decisions made in the last two transfer windows. Supporters inevitably first turn their frustrations on the manager and it seemed as though the opinion of some of the fans had turned implacably against Jackie McNamara before he was relieved of his position last September. McNamara had endured a disappointing 2015 after the winter transfer window closed with the club selling Gary Mackay-Steven and Stuart Armstrong to Celtic on deadline day. United played 30 league games under McNamara in 2015, losing 17 of them and winning seven (23%), while his overall record was played 99, lost 39 and won 38. The team's record in the Premiership under Paatelainen is played 15, lost 10 and won two - a win rate of 13%. When the Finn took charge, United were bottom of the table, but only one point adrift of Partick Thistle. Only 12 points separated United from Hearts in third place. Now, United are 13 points behind second-bottom Kilmarnock, albeit they have a game in hand. The run of results under Paatelainen has been poor and there has been little sign of any kind of resurgence. The team was already in wretched form when he succeeded McNamara but Ross County were also bottom when Jim McIntyre was appointed as manager in September 2014 and once the January transfer window closed, he steered his side to 10 victories from their remaining 15 league game and finished ninth - eight points clear of the relegation play-off place. The comparison is damning for Paatelainen, because it shows that alternative was possible to the growing sense of resignation about the club's fate. Supporters, in the main, seem to have almost accepted relegation is inevitable, although the inconsistency of all the sides in the bottom half of the Premiership means that nothing can be taken for granted. There are more fundamental issues to be addressed, though. Thompson has previously been adamant that he sees Paatelainen as the right manager for United in the longer term. January signings were underwhelming, with only Eiji Kawashima and Guy Demel starting regularly, although it is generally a difficult window to do business in. In his statement, Thompson says that United have the third-highest wage bill in the top flight, which means that in the space of less than two seasons Hearts have built a squad of better ability and value for money. That ought to alarm a club that has been established in the top six until this season and has a large playing squad. There is also the potential financial consequences of relegation for a club that runs at a loss and has been reliant on player sales to counter that. Thompson's statement admits to failings, by the board and by the team. It also represented a last attempt by the chairman to rebuke the players into a response. Whatever happens, though, United need to improve their recruitment. Two managers have failed to wring more out of the squad, or improve it across two transfer windows. The legacy of that could be a spell out of the top flight.